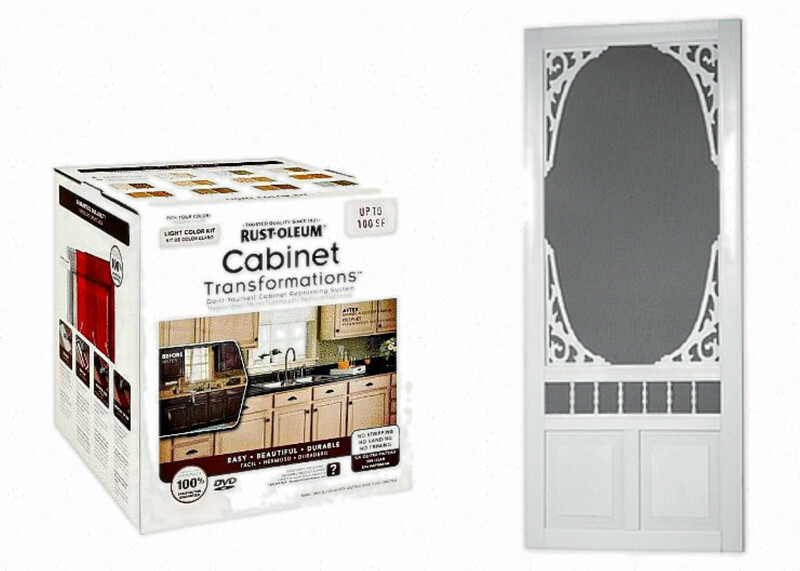 The Rustoleum Cabinet Transformation kit is wonderful for it’s convenience and ease of use. The paint acts as primer and paint in one, however, what you are viewing is FOUR coats of paint and honestly I think it could use one more. The paint is wonderful. It’s very forgiving and shows virtually no brush strokes. 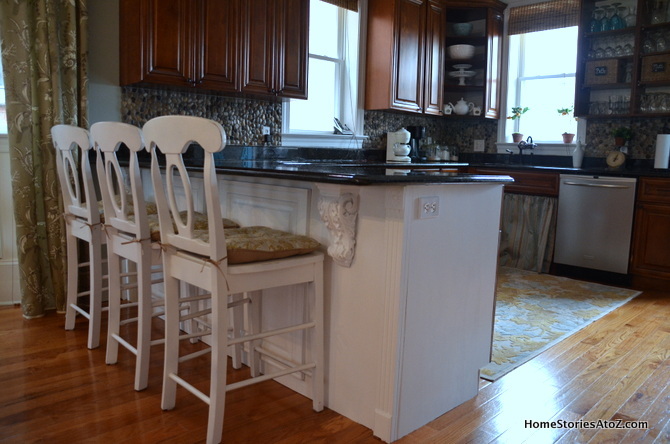 But to take dark cabinets to white, be prepared to get cozy with your paint brush! I can hear the big question that you’re asking. Will I paint the rest of my cabinets? Yes! But I’m going to do it very slowly. Matt is such a trooper for putting up with a wife who is constantly tearing apart the house. He’s not crazy about the inconvenience the kitchen painting will cause all of us, so I’m going to just do one little section at a time and hopefully by the end of the summer I’ll have the white kitchen that I’ve wanted for the last three years! For now, I’m enjoying my gorgeous white peninsula! I am loving how our black granite completely pops against the white! I also added a screen door to our pantry. The door was originally white, so for fun I spray painted it a pretty aqua color. The door needs to be planed on the top because our house has settled over the years, but I’m terrified of messing it up. I’ll save that project for a day when I’m feeling braver with my planing skills :). I backed the door with some fabric for the photos because my pantry is ready for another makeover (aka–it’s a mess in there right now). These two small updates have freshened up the space and given me hope that one day I’ll love my kitchen! Find Lowes on Facebook, Twitter, and the LCI blog! Disclosure: As a Lowes Creative Ideas Network Blogger, I was given a giftcard to help with this project. Beth! I love your white peninsula! White kitchen cabinets are on my some-day wish list too. And your aqua pantry door is so fun! It’ll look soo beautiful against a white kitchen with that chic black counter! I can already picture it :). Our house is full of rocks (so is my head) so I’m pinning the back splash to remind me I might want to do that. Love your white island! Makes such a difference. Which of the Rustoleum colors did you go with? Did you use the glaze or skip it? I’m wanting to paint our kitchen cabinets white but have been debating over which of Rustoleum’s white colors to use. Thanks! That is gorgeous! I love the screen door! I would love for you to share this (and any other house projects) at my “May House Par-tay” at http://www.cheapcraftymama.com! I want to add closet organizers to the master bedroom and cabinets to the laundry closet. 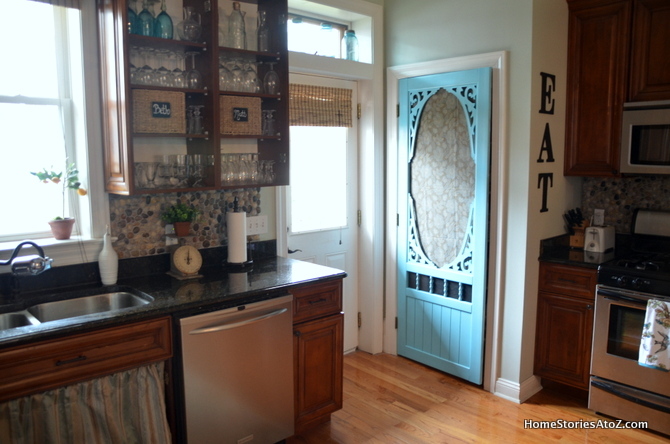 The cabinets look great White and I love the idea of the aqua screen door for your pantry. I love Lowes & Home Stories A to Z. You have actually inspired me! 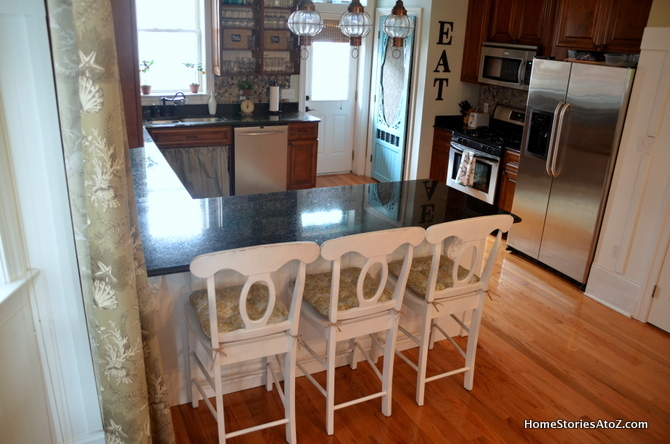 I have been wanting to redo my kitchen island and after seeing how pretty yours turned out, that is whatbi am going to do! Thank you! I want to redo the ceilings in every.single.room. I would also love to get paint for my kitchen cabinets! I’ve been putting it off for years…I love how your island turned out! It’s beautiful!! I love the white cabinets! We are currently in the process of painting ours! The black countertop really does pop! I would love to get new kitchen cabinets, our house is older and there isn’t much in the way of storage. New cabinets would definitely help us to get organized in the kitchen! There is a curtain rod that I am obsessed with at Lowes. I go and visit it. of course the counter top in kitchen or bathroom! thanks for the giveaway! I need to redo my kitchen countertops. This is perfect! We just bought a house and it needed to be updated badly . I would love to win a Lowe’s gift card . I need more paint for the dining room! I love all your ideas! Thanks for a chance to win!! Would love to get a pantry door and new door knob! I need to organize my pantry and closets!! I need to tackle my photographs…I have an ever growing pile. I really want to tackle my office. It’s basically the junk room right now and not functional at all! The pantry door is on my to do list. I finally found an old door I can repurpose for this! My pantry door is only 23 1/2 inches wide! Yes tiny but it is a walk in! I’m planning to take out the inside panel and add glass. My hubby is on board as I usually need him for those things too! A Lowe’s gift card would be awesome! Thanks for the giveaway and your blog is truly one of my favorites!!! Gorgeous updates, Beth! I’ve been scouring barn sales/yard sales for the perfect screen door for keeping the cat out of our unfinished basement with an open stairwell. I never considered looking at Lowe’s. That one is so pretty! And I love the new island color. Really brightens things up! I need to organize my plastic container cabinet! Right now I have to hunt forever to find lids etc..
My kitchen floor is the same cheap vinyl we picked in 1996 because it would hide the dog hair. 😉 I’d love to replace it with laminate or wood! I also wanted a white kitchen forever,and once I made the decision to do it, it took me almost 9 months to get it done by myself. I did mine in sections which made it bearable and not so disruptive!!! I started with my island and I knew there was no turning back. I love it!! Oh yay! I know it will take me a long time to get done, but I’m ready for it :)! I need to tackle my son’s closet! This would be the perfect start…thanks! I’d love to redo my guest bedroom! It’s a mess! Wow, your kitchen looks great! It’s amazing what a little paint and elbow grease can do. I just finished our main bathroom and would love to get my laundry room shaped up and organized. Wow, your kitchen looks great! It’s amazing what a little paint and elbow grease can do. Thanks for sharing. I love the pantry door , can you tell me what color that is you used and what size door you used? My pantry is 28 wide . Beautiful job in your kitchen, by the way. Stunning work. Our bedroom closet would be a great place to start, or maybe the basement crawl space, or my craft area, or my son’s closet…this might take a while! Absolutely love the white island and the Aqua door! I have a guest room to redo and the Loew’s card would be a great way to start. Thanks for the chance. You did it! A fantastic start to what I’m sure will be a gorgeous white kitchen. I love your painted cabinets and want to do this also…..I like your idea of doing small sections at a time….what a great idea…..
O goodness. Just this morning I sat looking at my pantry doors …saying to myself. Self: YOu must do something with these yucky doors! 🙂 I hope I win! wooo hooo! Really need to organize my craft/catchall room. It’s looking a little cluttered at the moment! And love the pop of color the screen door adds! We are updating a house built in 1993, and I am running to Lowe’s every other day for something! $100 would sure help! Thank you for the opportunity! Would love to use the gift card to build a new organizational system in my small pantry. Thank you! I really need to organize all of my kitchen cupboards and my closet. Ok, really I need to organize my entire house. By the way, I love the white on the island! I have wayyyy too many fix up projects that need to be done around my home. $100 gift card from Lowes would be a great motivator to get them started. My craft room/office is in serious need of some organization! It’s still sitting in pretty much the same disarray as when we moved in almost a year ago! It’s just been put on the back burner too long! Oh my gosh there isn’t enough room on what I need done on my house, ha. I am a newlywed and moved into my husband’s house. Um let’s just say it really needs help and that is an understatement. I want to update our living room, it has been the same for too long. Love your screen door color! I have about a zillion projects that are on my “wish list”. One being a new coat of paint in our master bedroom! I want to do EXACTLY what you did to your island! My husband is not big on the idea of painting our cabinets either but is my dream. He built us lockers that I convinced him to paint white and I am HOOKED. Thanks for posting this! Love how it turned out Beth! I’m planning on painting our kitchen cabinets this summer, so I’m pinning this for future reference. Love that pantry door too, such a fun pop of color! I’d love a kitchen backsplash, but I don’t know how to decide with black granite and dark cabinets!? there is so much i need to do. but just updating my counter tops would be SUCH an improvement. Oops, and I would love to tackle the organization of my laundry room. It’s…icky. I am in the planning stages for my new craft room. I am so excited to have a dedicated space, but I am starting with an empty room so I definitely need the inspiration!! Hmmph, tough because I have several projects I’d like to tackle. The main one would be the kitchen cabinets. I love the way yours turned out!!!! I’m browsing different sites to get ideas. I’d like to finish the basement. My wife and I would love to have a kiddie play area for them to relax and play. We’ve purchased some of the materials already. Just waiting for the summer to come along and get us on the right path. Love the screen door and the color. You have given me some good idea’s for my kitchen. Love your kitchen!! I really like the rock backsplash, that is such a neat idea. I need to redo every room in my house! The last room we painted was my son’s bedroom and that was like 7 years ago! My bedroom and bathroom are the worst. The bath simply has no style and the bedroom has a scalloped flower wallpaper border around the middle with a dark tan on the top half and a dark green on the bottom. Been that way since I can’t remember when. Soo over that look! Hope to get some serious painting done soon. I would reorganize my bathrooms! I would love to tackle our home office! my office! its such a mess! Great job! I too will be painting my 80’s oak cabinets this summer, and I am leaning toward two colors–light on top, dark on bottom. I am encouraged to see that yours was successful! My pantry is top on my list for organization…it’s like a jungle. The screen door is my favorite!! My garage definitely needs organizing! I just painted my kitchen white a few months ago and am LOVING it!!! It took about 4 days and then I was really careful with it for a few days after that to be sure the paint was good and set but it was totally worth the work!! We are in the process of building our forever house. There are so many projects that need to be done! The screen door for the pantry is such a fun trend right now. I had pinned a kitchen I loved that used that idea, but I’m not sure I could pull it off. Mine is always a disaster. I love the blue on your door. What a great place for some color! I’ve promised myself to finish my office project before going on to anything else in the house! Just bought a pendant light from Lowes and it looks great. I love how this turned out. We’re going to paint our cabinets this summer so it’s nice to see how great this looks! I need to paint my kitchen island and master bath cabinets. You’ve inspired me! Your cabinets are amazing! Great improvement! Thank you for hosting the giveaway too! Love your white island and your new aqua pantry door. Both beautiful additions to your already beautiful kitchen. Thanks for sharing. I’d love to be entered into this fun giveaway! Love what you did to the island! I want to build bookcases and a window seat in our loft – I have the perfect spot! I do LOVE how that turned out! I want to spiffy up our kitchen as well!!!! You did such a great job. I need to tackle the lihting in my kitchen. Ther is just not enough! My attic has become a depository for all my craft things, out-of-season clothes, holiday decor and anything else there’s just no room for downstairs. I’d love to install some shelving and bins for organizing everything so it doesn’t look like an episode of hoarders up there anymore. I need to re-do flooring on my stairs and a few other areas…a.k.a. rip up the carpet! I would like to add some storage/organization to my laundry area! GORGEOUS!!! And I love the screen door on your pantry!! We would finish our new bathroom that we are adding to our detached garage. I am working on a project in my basement that I could really use the Lowe’s card!!! I would love to win a Lowe’s gift card. If I did, I would have a hard time deciding which project to do – bathroom vanity/mirror update or kitchen wallpaper or front porch redo. I would love the opportunity to decide! I am just going through my first home buying experience, and I really need a new lawn mower….but I might splurge and buy some fun aqua paint and paint my back door. I would LOVE to repaint my master bedroom. I’ve had swatches for months & I’m ready to commit! I would use that gift card for decorating my daughters’ bedroom. Can’t wait! Did you just say you found a farm sink for FREE??? You lucky ducky you! How fantastic! You’ll have to share a pic of your kitchen with us :). oops.. this will help you see our progress. So loving the island Beth! I too am slowly painting our cabinets to accommodate my hubs 🙂 I have an end of summer goal as well. Our Kitchen is in major need of some organization… like for real organization! I want to re-do my outdated kitchen. It has linoleum floors and the original cabinets. It looks western and dated. HATE my kitchen! Your cabinet project looks great. I will look forward to seeing the completed kitchen. My organization that needs to be tackled is my craft/spare room. Yikes!!!! I need to do something to my entryway. It is drab and uninviting. Love the white island and the screen door is perfection! 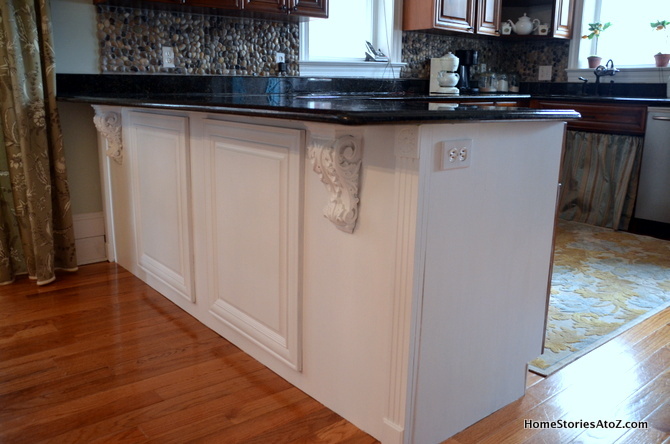 I really like the idea of the corbels and the cabinet doors… at least I think that is what you did. Really love the white! It really brightens up your space! Love it Beth…..I have been wanted to paint mine for 5 yrs and can’t get motivated to do all the work! Looks awesome, Beth! Painting our kitchen cabinets is on our to-do list this spring/summer. The gift card would go towards the purchase of bead board wallpaper for my master bedroom remodel. I would love to add upper cabinets to take the kitchen cabs all the way to the ceiling. I’d like to fix our deck. I would love to redo my foyer floor! I want to redo our guest room! I LOVE your island/peninsula! it looks gorgeous in white. I love that you are going to be getting to the cabinets because that is so what you want. But I think your kitchen looks beautiful. The cute pantry door is fabulous, the color brings out the color of your glasses on the shelf. I love this shade! Great job! AMAZING!!! I want to paint my kitchen cabinets, too! I REALLY need to get my homeschooling materials organized … and my crafty supplies could use a little attention, too. I need to UPDATE everything! We moved here 10 yrs ago & like you I was in a “earthy mode”. I’m ready to move on! I really need to tackle our pantry closets as they are in terrible shape … need lots of new shelving and doors! Well spring must mean organizing because so far I’ve tackled the garage, the nursery, redone my son’s nursery into a big boy room, and cleaned out my pantry. I’m procrastinating on my master closet, because no one ever see it! I really want to organize the garage. It is a mess! Your kitchen is going to reflect so much light. You r gonna love it! LOVING the unexpected turquoise screen door. Whimsical and fun I see your vision was started with the old turquoise ball jars on the sill over the door. Good eye Cyndy :)! Yes, those jars were indeed the color inspiration for the door! Hi Beth! I would love to work on my kitchen. My cabinets need to be painted. The new white looks beautiful in your kitchen! And that door is the perfect color. So pretty! Goodness, I love the screen door on your pantry! I may have to do that to my laundry room when I’m finally done with it. I want to tackle our pantry. It’s a disaster. Island…Door. Door…Island. It’s a tie for the “wonderful factor.” Thanks for sharing. Love the island. I painted my cabinets white recently and I’m so happy I did. Hi! I just stumbled on your blog today. I love your deigsn style! You have literally inspired me to go to deigsn school! In the last year, I have found a passion in decorating. I stay up sometimes all hours of the night looking at magazines and searching blogs. Speaking of cabinets, I really want to paint my kitchen cabinets. My walls are a barn red. They were like that when we moved in and I kept them because they were kind of nice and I was pregnant. What color cabinets would go with red walls? Is white the only color? I love love green, but that would look like Christmas! What would you suggest? Thanks! I’d like to put bead board wallpaper in my master bath. we have to and i mean HAVE TO redo our masterbath in our new house….i could really use $100 from lowes!! The aqua screen door on your pantry – just perfect! I’m anxious to organize my TINY master bedroom closet and “find” some more space. I want to organize my home office in the worst kind of way!!!! Continue painting furniture! I get all my supplies from Lowes! Love the white cabinets! I’m trying to work up the courage to use the countertop restoration kit! Love it Beth! Best decision I ever made was painting our outdated oak cabinets. It was a huge undertaking, but I don’t regret it one bit. 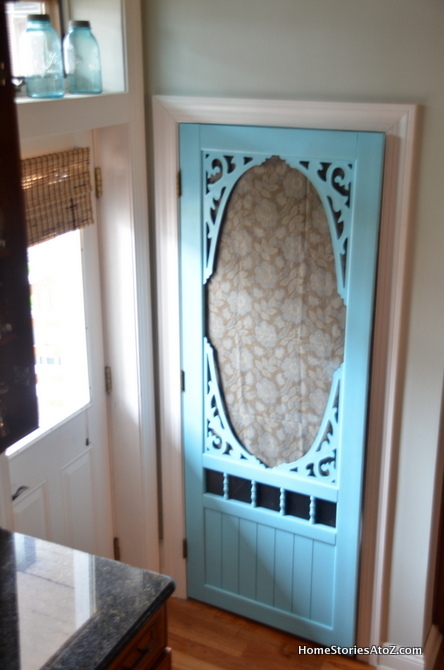 I ADORE the screen pantry door as well, so cute and the color is perfect! Okay this has really inspired me. I have some dark oak cabinets made in the 70’s and I really want to do this. I live 100 miles from the nearest Lowe’s (I know! huh! )but I am there about once a week. I love the service at Lowe’s. I’m headed back to your blog to check out what you did and what you used. I would love to update my patio by adding storage and make it usable again!! Your cabinet looks great! I saw that product at our Lowes. We need to update our front porch and finish some work in our family room and the stairs to the basement. I love your island! 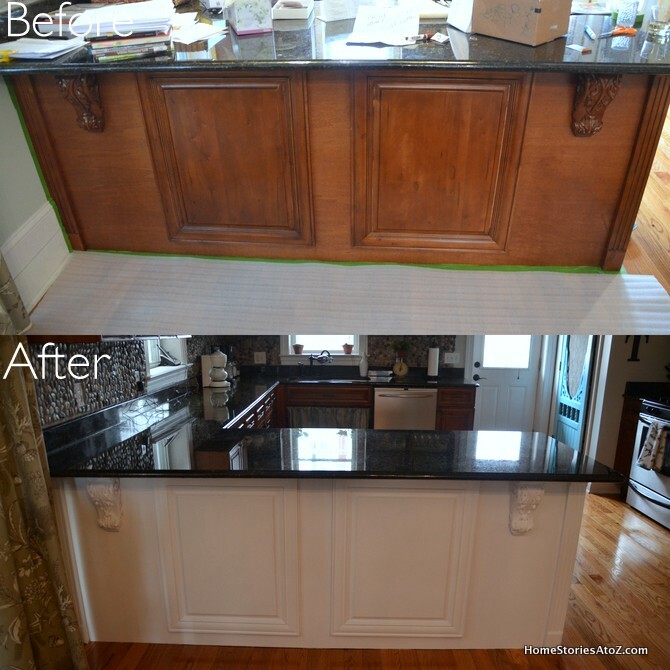 I painted my cabinets YEARS ago and let me tell you, its just as much of a pain as you would imagine, however, its completely worth it…(it was a tense couple of weeks around these parts when the kitchen was completely dismantled for the painting!) Your pantry screen door looks like a million bucks..I’m contemplating painting mine (its an “off” size so replacing it would be difficult) and I think you’ve convinced me to do it, it looks fantastic.. I would love to redo our bedroom, some new curtains & rods. I LOVE the new look, brightens the room! I really need to finish putting baseboard and trim up in my house! Great peninsula update! I’m in the process of painting my cabinetry and I’m doing it the exact same way- one section at a time! I have a stairway that needs some updating, so I’d love to win the gift card! I want to finish our master bedroom. I’ve only done one thing so far (getting new linen) and it needs a lot more work! After seeing your island, I’ve decided that will be my next project….add beadboard to the ends, paint and add trim around the bottom. HI Beth…Susan here ,just wanted to let you no your cabinets really turned out great was wondering how those kits worked ….we just bought a kit to do our refrigerator in stainless steel look….Looking forward to it…So glad you shared this with us ..I’ll let you know how it turns out….p.s love the pantry color ..
Looks great! I have to tackle my small garage. With a family of 6 and a small house, we need the garage to service as storage, work space, and laundry room all in one. I want my dark cabients (which look similar to yours) white so badly I can’t even stand it! It would be a huge undertaking but I know it would be soooo pretty! Can’t wait to see the rest of your kitchen throughout the summer! I feel your pain girl! It is definitely an undertaking but I think going slow and doing it in small sections will make it doable. I hope you get the white kitchen of your dreams soon too!! I would love to update and organize my kitchen as well. Its VERY SMALL, and traditional cabinets are just a no-go….i would love the storage to be more effective like pull out shelving to make use of all the dimensions…plus these were the “default” cabinets…so to be able to paint them a nicer color would be a dream!! I would love to spruce up my kitchen and family room (both are one big room). I have oak cabinets and black everywhere. It’s time for some white here too! Thanks for the inspiration. LOVE it white Beth!!! Looks SO good! I went from oak to a creamy white in my kitchen over a year ago and I have NEVER regretted it! And that screen door is AWESOME! I love it! Thanks Lou Cinda! I am loving it so far. I know I won’t regret it. I have wanted an all-white kitchen for literally YEARS now :). I loooove your mini-makeover. I want to paint the cupboard in my kitchen…this has given me inspiration. I REALLY need to tackle our garage. I’m totlly loving that screen door though 🙂 SUPER CUTE!!! The screen door to the pantry has to be my favorite upgrade!! I wish I had a pantry so I could do this! Love the bright white, Beth! And your screen door is so fun! I want a white kitchen too! Its so pretty! Love the island and the pop of color with the pantry door. I can’t list just one! I’m going to be a first time home owner soon and I have so many ideas. I will probably start with the kitchen since that’s one of the most important parts of the house. Thanks for the chance!